How To Preach A Sermon From Ephesians 5:1-7 is a succinct sermon outline of these seven verse of Scripture which you could preach to people of God. Surrendering all to God seems impossible. Even though we know in our heart of hearts that is what God desires of us when we become Christians; nevertheless, surrendering all to God seems impossible—to give our lives totally over to Him for His purposes seems an impossible ask! And yet, a young teenage girl surrenders all to God. Mary, the future mother of Jesus, was able to surrender all to God. I wonder, what makes a young teenage girl surrender all to God? What makes a teenage girl give her life totally over to God for His purposes? The answer is not something profound. To put it in Mary’s words, "Behold the maidservant of the Lord!" (Luke 1:38a). To put it simply, Mary was a submissive servant of God. Nothing more, nothing less! Nothing mystical! Nothing super spiritual! Mary was simply a submissive servant of God and she wanted her life to magnify God. When we become Christians, God wants us to surrender all to Him and God wants us to reflect godly qualities in our Christian walk. After all, we are new creatures (creations) in Christ, old things have passed away, behold all things have become new. What are these qualities that we should reflect in our Christian walk? Look at verse 1, "Therefore, be followers of God as dear children." The word followers here comes from the Greek word to mimic from which we get the word imitate. But what does it mean to be imitators of God? One Bible version says this: "Since you are God’s dear children, you must try to be like Him." To put it in its simplest form, it means to reflect the qualities of God in our Christian experience. That is, our lives should reflect God's justice, God's wisdom, God's faithfulness, God's goodness, God's love, God's mercy, God's compassion, God's tenderness and God's forgiveness. This is not something we manufacture. It comes as a result of God's work in our lives. As we surrendering all to Him, He will mould and shape our lives. Look at verse 2, "And walk in love..."
What kind of love are we to reflect in our Christian walk? What is this love we are to live? 1 Corinthians 13:4-8a, "Love suffers long and is kind; love does not envy; love does not parade itself, is not puffed up; does not behave rudely, does not seek its own, is not provoked, thinks no evil; does not rejoice in iniquity, but rejoices in the truth; bears all things, believes all things, hopes all things endures all things. Love never fails." Purity means freedom from moral corruption or evil. I like that word freedom. In other words, as a Christian I can say no to certain things. I find that liberating. When we surrender all to God, He will check our behavior and our speech. Look at the end of verse 4, "but rather giving of thanks..."
The world tends to make a joke of the good things that God has given to us. But God wants us to be thankful. When we become Christians, we must learn discernment. We must learn to discern what is pleasing to God and what is not. Also, we need to discern what is true and what is error? There are so many competing voices out there in the world today. It is important that we discern what is true and what is error and what is pleasing to God and what is not. Discernment will help us in this task. Surrendering all to God is an ongoing experience. When God works in our lives, those qualities will be reflected in our Christian walk. Walking Wisely in the Lord is all about God getting hold of our time, thinking and testimony. Click here for more Sermons From Ephesians. This sermon follows a deductive methodology. 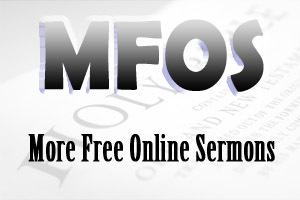 The main preaching point is followed by sub-points and incidental points. For more information on deductive and inductive methodologies, click on the following link how to preach a sermon.